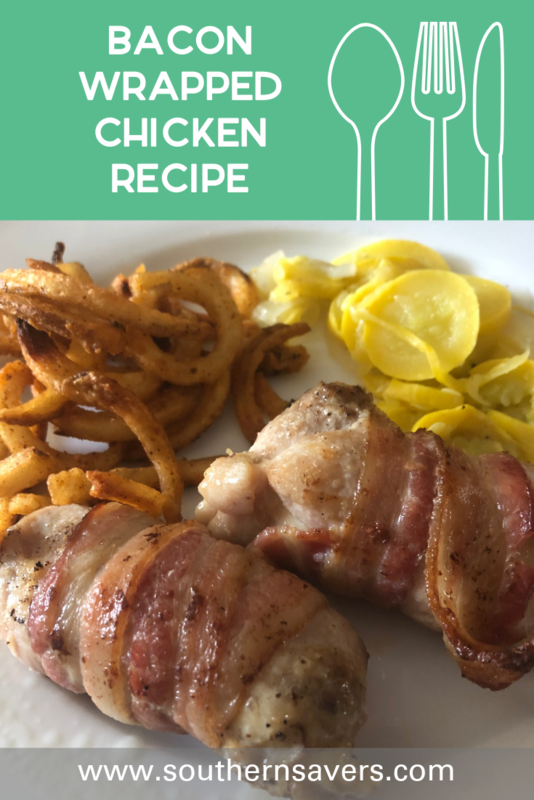 I discovered this recipe when I was trying to do Whole30 for a month, and while some of the things I tried during that month have faded away, this recipe has stayed on our family’s regular rotation. It’s not hard to see why—anything with bacon tends to be a big hit! While meat-heavy dishes may not always seem like the most frugal meal choice, I can usually get bacon on sale and chicken thighs tend to be one of the cheaper meat options. And those are the only two ingredients other than seasonings! For sides, consider our sauteed green beans or a fresh salad. 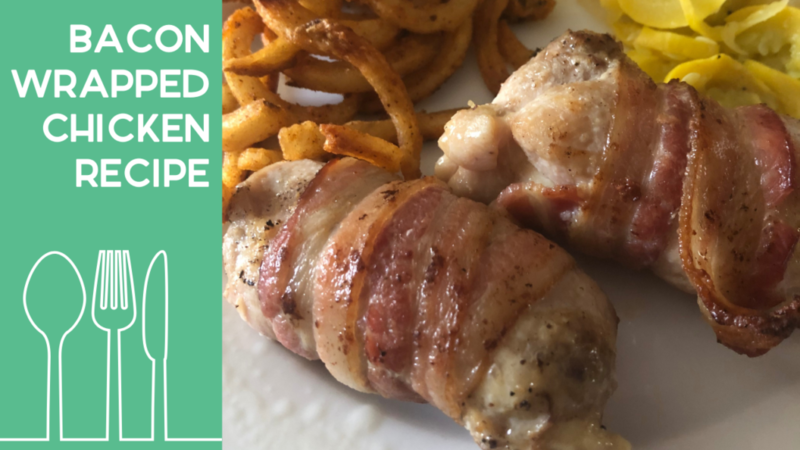 Depending on the kind of bacon and chicken you buy, this bacon wrapped chicken is great to paleo, keto, and gluten-free diets! As I was writing this post, having just pulled our grill out recently, it occurred to me that this would probably also be great on the grill without even having to brown the bacon ahead of time. Let me know if you try that! Set out a 9x13 pan or similarly sized baking pan. Determine how many slices of bacon are in the package (usually 12-16). Cut the medium-sized chicken thighs into two pieces lengthwise and the larger thighs into three pieces so that you have the same number of chicken pieces as you have slices of bacon. Lay the pieces on the cutting board and sprinkle with all the spices, then flip them over and season the other side. Heat a large skillet to medium-high heat. While the skillet is heating, wrap each piece of chicken with a slice of bacon. Once the skillet is hot, place the chicken pieces in the skillet in batches, cooking on each side for a couple of minutes until the bacon is browned. Place each piece in the baking pan with the side with the bacon ends on the bottom (so the chicken stays wrapped). Once all the chicken pieces have been browned, place them back in pan and cook in the oven for about 20 minutes or until the internal temperature equals 165 degrees. Another great thing about this recipe is that you can do the first part where you brown the bacon in the pan earlier in the day, then just pop the pan in the oven at dinnertime. 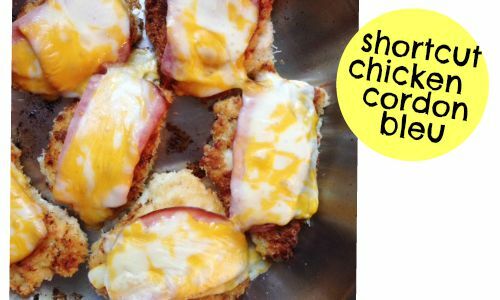 After making bacon wrapped chicken several times a month for several months, I decided to mix it up by trying this cheesy bacon chicken. My family liked it, but surprisingly, they said they preferred the version without the cheese (which is probably the first time anyone in my family has said something was better without cheese! ).